Shaquille O’Neal was inducted into the Naismith Memorial Hall of Fame in 2016. O’Neal has his No. 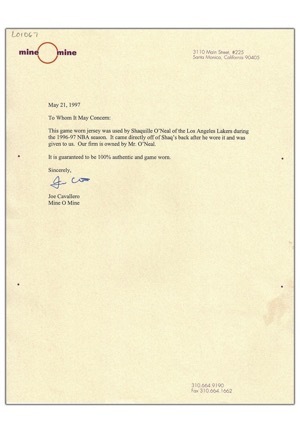 34 retired by the Los Angeles Lakers franchise. 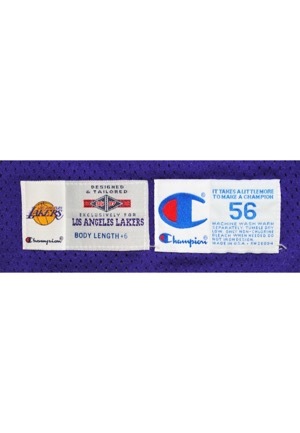 On the front left tail is the Champion manufacturer’s tag size “56” with washing instructions. 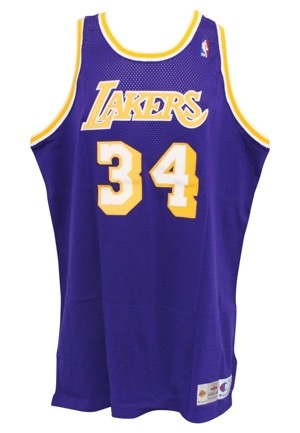 Adjacent is a Champion distributor’s tag that reads, “DESIGNED & TAILORED 96-97 EXCLUSIVELY FOR LOS ANGELES LAKERS BODY LENGTH +6”. On the left inseam is a flag tag with the body fabrics. On the upper left chest is the official “NBA” logo embroidered. 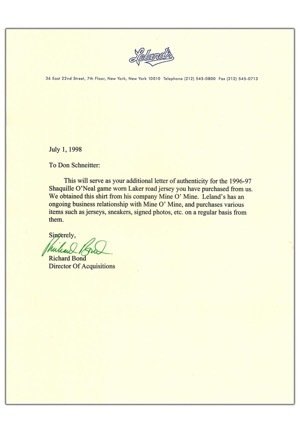 Typically during the 96-97 season this NBA logo was embroidered in gold representing the 50th anniversary of the league, but there are photos of Shaq wearing the traditional red, white and blue logo in this season. 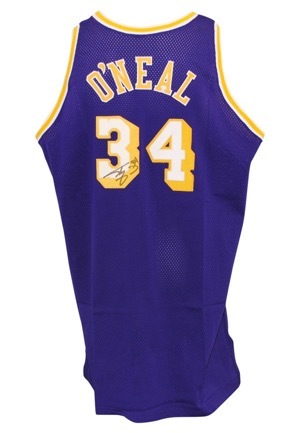 Across the chest reads, “LAKERS” and across the back is the player name “O’NEAL. These are done in gold on white tackle twill. The player number “34” appears on both the front and on the back in white on gold tackle twill. O’Neal signed the back of the jersey inside the player number in black marker and in our opinion the signature rates an 8. 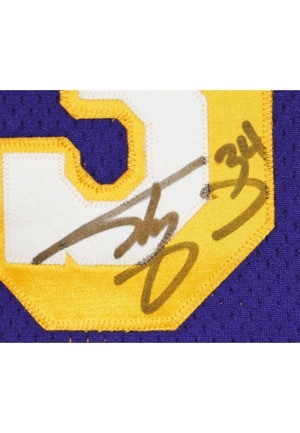 This jersey is properly tagged, was presented to us as game-used and in our opinion shows light use. Accompanied by a LOA from JSA and a Mine-O-Mine LOP.